Despite Japan’s very low level of unemployment and a multi-decade high in the vacancy rate, wage growth is muted. This can be seen in the following charts. This is due to a number of factors, which we discuss below. 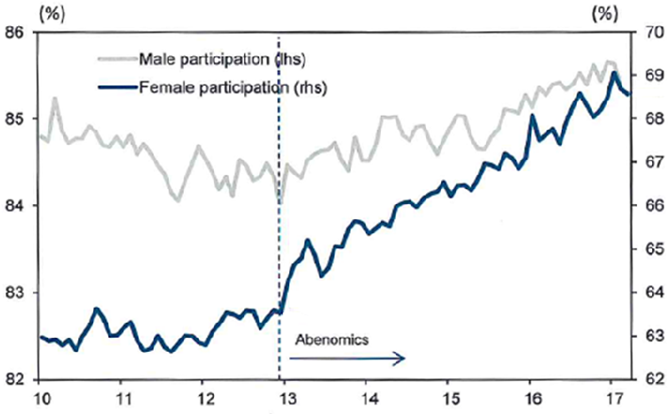 Firstly, the composition of Japan’s labour market is changing, with part timers and women becoming an increasingly large proportion of the workforce. Secondly, expectations of future inflation are formed with reference to past experience, meaning long periods of low inflation can have a profound influence. Indeed, despite a massive increase in the monetary base since the start of Abenomics, core inflation is hardly changed in Japan, suggesting that a deflationary mindset has become firmly entrenched. The BoJ now faces the prospect of either losing credibility, or of continuing balance sheet expansion, which many also regard as stretching credibility to breaking point. Japan’s deflationary mindset can also be seen in the fact that firm-specific labour unions have a strong preference for job security over higher remuneration. This means less pressure to increase wages, despite tight labour market conditions. 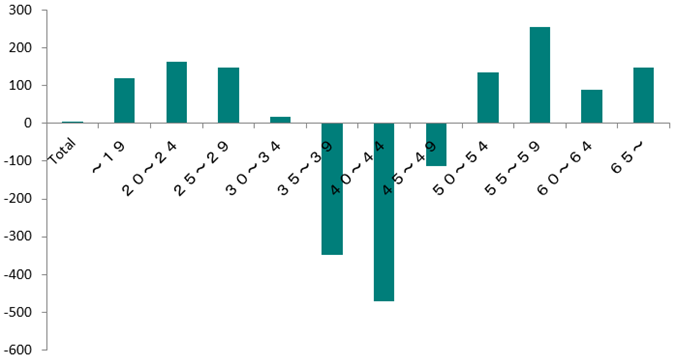 Thirdly, as the chart below demonstrates, the proportion of the highest paid workers (aged 40-54) in the total workforce has risen by 4.2% over the last ten years. 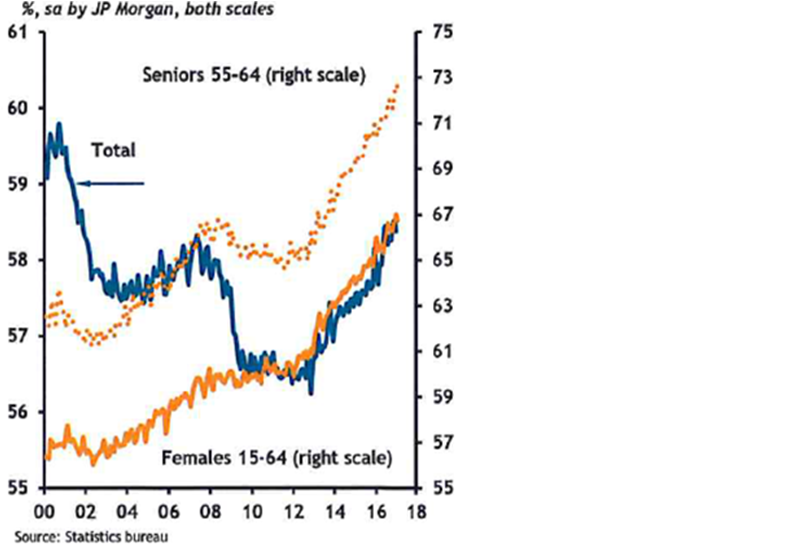 Japanese companies have therefore been forced to flatten the age-wage curve to offset the higher costs associated with this increase in well paid middle-aged workers. 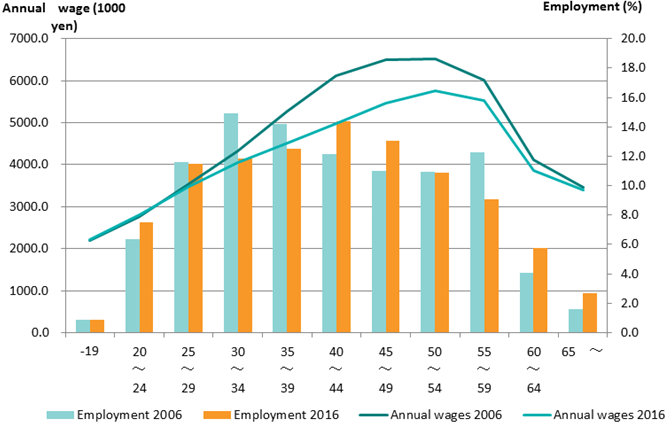 The impact of this trend can also be seen on the following chart, which shows that net wages have been falling for middle-aged workers. Wage declines for middle-aged workers are also due to the changing composition of the Japanese labour market, which has seen a decline in highly-paid males and a corresponding increase in lower-paid females. If this trend persists, it will exert continuous downward pressure on average wage growth in the coming years. Similarly, the proportion of workers in the generally low-paid fields of health care and care giving has risen continuously to 13% of the total labour force. As the graph below shows, employment in this sector has increased by over 50% since 2004. At the same time, wages in the sector have declined by some 10%, while nursing insurance benefits have been curtailed, reflecting government budget constraints. 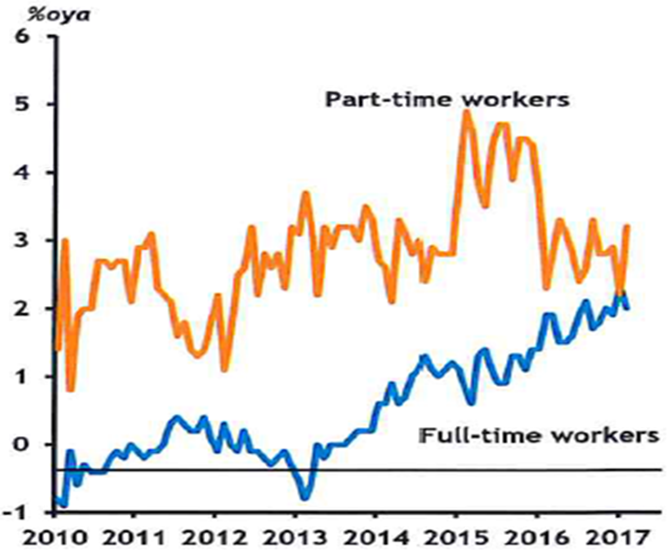 Another factor that helps to explain the lack of wage growth in Japan is the continuous increase in employers’ social security contributions. This raises the overall cost of employment, placing further downwards pressure on wages. Finally, recent changes in the enforcement of a ceiling limiting the number of overtime hours have further reduced incomes. 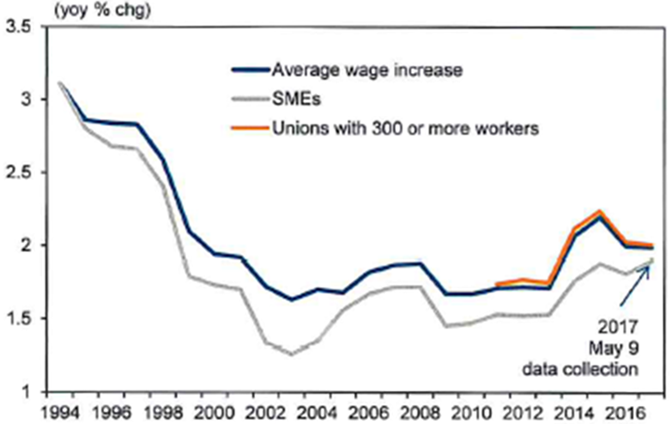 Companies are not only cautious about raising wages, but also about increasing cap ex. 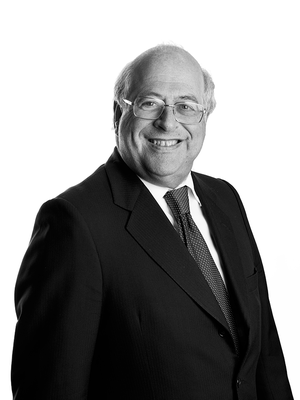 While company profits are at record levels, cap ex has hardly risen. As can be seen below, this has resulted in companies stockpiling cash. 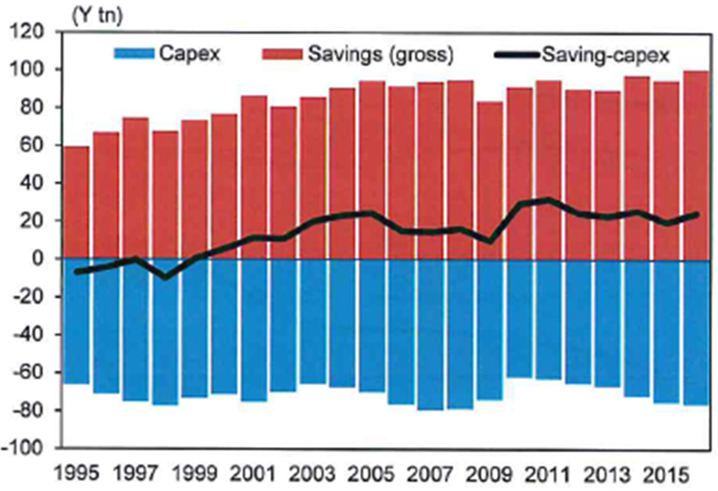 Inflation in Japan has been consistently close to zero over the past 20 years. 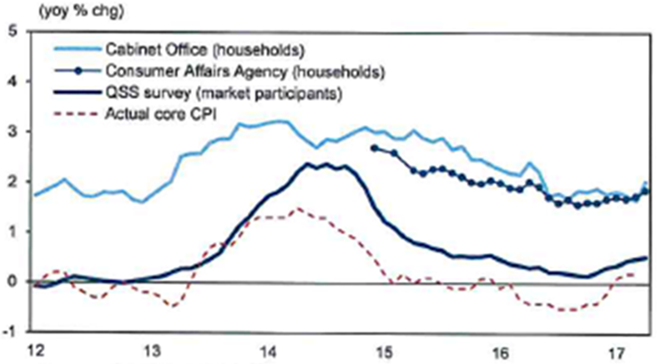 Given our assessment of the labour market above, we expect only a very gradual improvement in Japanese core inflation. Indeed, without further increases in commodity prices or a pickup in wages, it is difficult to see why inflation should rise at all. This is perhaps unsurprising. 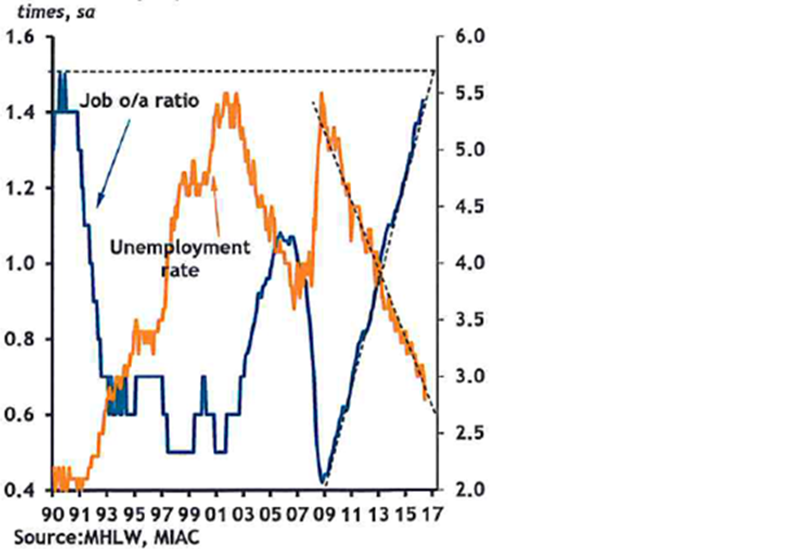 After all, it is difficult to achieve both reflation and reform at the same time. Reform measures are by their very nature disinflationary as they are intended to improve the productivity of labour and capital. 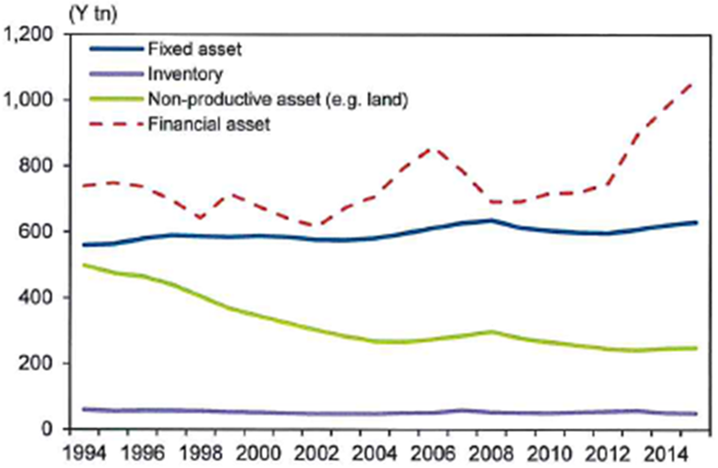 Thankfully, limited wage gains in Japan should mean a benign environment for corporate profitability. Meanwhile, improved capital discipline suggests that more of these profits will be returned to shareholders in dividends and buybacks.